Expanding into new waters, the Explorer Ventures Liveaboard Fleet adds an incredible itinerary in the Red Sea, and a new yacht in the Maldives. Known for excellence in service, Explorer Venture’s latest liveaboards Grand Sea Explorer and Emperor Explorer are specifically designed for luxury. These contemporary vessels will provide tranquil cruising throughout two of the world’s most exotic diving destinations. Red Sea departures are already available for 2019, and departures in the Maldives launch this August. Explorer Venture’s growing fleet is now comprised of 8 liveaboards in 7 destinations worldwide. The Grand Sea Explorer joined the fleet this January. At 134 feet (41 meters) in length, she is the epitome of luxury. Intended for pampering guests, she provides a level of service found nowhere else in the Red Sea. The Grand Sea Explorer’s 7-night itinerary takes guests through the Brother’s Islands, Deadelus Reef, and Elphinstone Reef Marine Park sites. Divers can expect a technicolor reefscapes and sightings of thresher sharks, whale sharks, mantas, oceanic whitetips, and hammerheads. Rounding out this new Red Sea itinerary is a must-do land extension to sightsee the pyramids in Cairo. This August, Explorer Ventures, in partnership with Emperor Maldives, will launch the brand-new Emperor Explorer in the Maldives. 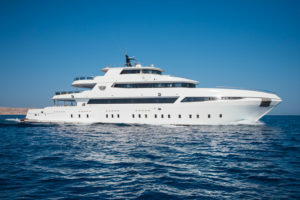 Offering modern and spacious accommodation, the 138-foot (42 meters) yacht accommodates 26 guests in 13 contemporary cabins. On Emperor Explorer, guests will not only dive on the abundant coral reefs of the central atolls, but also have the opportunity to observe the world’s largest known population of reef manta rays. Whale sharks are seen year-round, and special itineraries allow you the chance to see elusive thresher sharks. 7 & 10 night trips are available for individual & full charter bookings. To learn about Grand Sea Explorer, Emperor Explorer, or read more about Explorer Ventures other destinations worldwide, visit www.explorerventures.com.